Artist Sean Aaberg asked me to be a part of a new publication called PORK MAGAZINE. I saw drawing "coming back" in the early 2000s, when Japanese art & design magazines started featuring drawings in their pages, since then, it feels like the lower echelons of the fine art world have accepted drawing as an acceptable medium. Still, the broader public has a certain weird attitude toward drawing, insisting on calling finished pieces "sketches", always seeing painting as the highest level of the tiered art system, etc. Then, add on the style of drawing which might be along the lines of Heta Uma (Bad Good) or the Manic Doodling style & people have an even harder time seeing the work as "serious" or "relevant", when I feel that this work is some of the only work worth looking at out there. Are they just old & out-dated? Can we convince the public that we are right? What do you think? 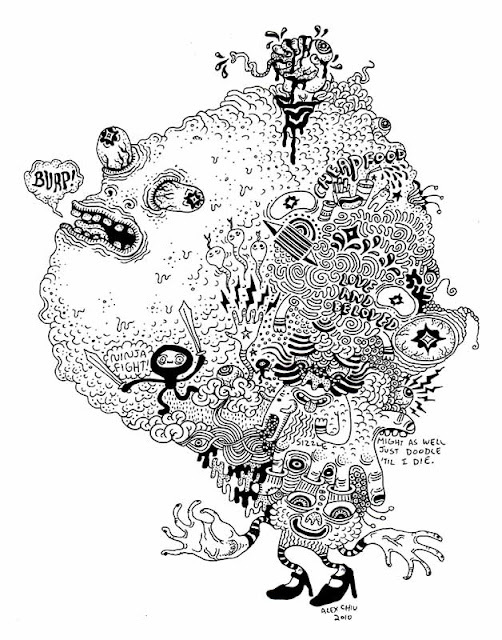 Islands Fold was the first publishing company to introduce me to this new culture of psychedelic, stream of consciousness, pattern based, cartoon cluster drawings. The tumor-like doodles were incredibly inspiring to me. They filled pages like cancer and I loved it. The first artists that I noticed producing this type of work included Luke Ramsey, Andy Rementer, Marc Bell, Peter Taylor, Peter Thompson, A J Purdy, Ron Rege Jr., and Michael Deforge. Today, I’ve noticed hundreds of artists producing similar types of work, some of which are gaining a lot of popularity. I’ve been producing my own style of black and white ink drawings for about five years now. In 2007, Neko Press Comics helped me publish a book of “doodles” entitled Chocolate Milk and Doughnut Doodles. The following year, I exhibited my drawings in a number of art shows and sold my books at various comic book conventions and tabling events. I have to admit that my career as a professional doodler was and still is a tough one. For the most part, the general public perceives my book as a children’s coloring book. I would also agree that most people are not willing to accept black and white ink drawings as finished art pieces. Over the years, I’ve had to develop different techniques of incorporating my drawings onto painted surfaces in order to find acceptance in the gallery world. However, I am not discouraged by my past experiences and still see the drawing and doodling world as gaining momentum and popular appeal. As I learn more about the genre of art that I create, the more I realize that there is indeed a history and cultural significance to it all. I would say that the movement is very much inspired by figures like Keith Haring, Philip Guston, and Robert Crumb. I personally give a lot of credit to the artists Marc Bell, Luke Ramsey, and the group Paper Rad. As time goes on, I’m sure that many of the newer artists creating this type of work will gain more credibility and bring more light to what is going on. There is way too much of this type of artwork floating around the internet, printed in books, put on merchandise, and hung in galleries for it to be dismissed as irrelevant or silly. At this point, I feel that it is up to the critics and art historians to get it together and start defining this movement. I am sure as hell that this type of drawing and doodling is an important part of the visual culture of the new millennium. I’m just waiting to see the rest of the world realize it as well. They are kind of creepy. I don’t know about evil. They do sort of sliver around though. That’s pretty sinister. I love that scene in Old Boy when the man eats the live octopus, tentacles squirming and all. It’s sort of beautiful. What is the most exotic thing you've eaten? There’s a fruit in Asia called Dragon Fruit. It’s like a cross between an orchid, a pineapple, and a kiwi. It’s pretty delicious.